As a system administrator, having all of your software utilities quickly accessible can make your job easier. One piece of software often used by admins is the Microsoft Telnet Client. 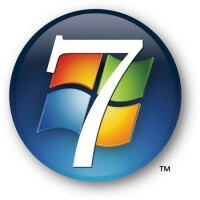 Unlike previous versions of the Windows operating system, Windows 7 does not have the Microsoft Telnet client installed by default. System administrators can quickly see this when typing ‘telnet‘ on the Windows 7 command line. 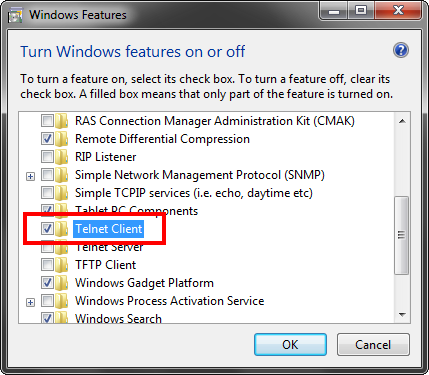 In this guide I will show you how to enable the Telnet client in Windows 7. 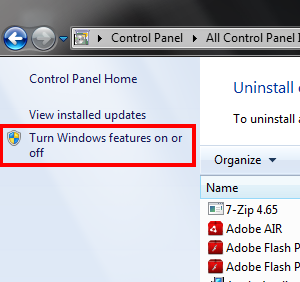 Click the Start menu and navigate to Control Panel > Programs > Programs and Features and select Turn Windows features on or off. In the new window that opens, scroll down until you see Telnet Client. Check the box and click OK.
Start the Microsoft Telnet Client by clicking Start and typing ‘telnet’ into the search. Thanks to hillzy76 for this tip. If you have any article ideas or other tips, be sure to send them to tips@techerator.com.